There were a lot of ceramics at NADA. Not that we blame the market for it (we love them too! ), but there are only so many ways to spell kitsch, or commodity object. A stand-out example of ceramic works, however, was presented by Geary Gallery. 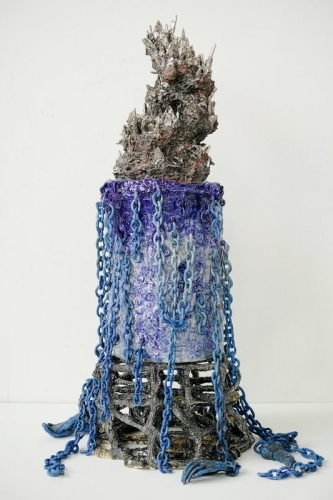 Originally from Macau, Brooklyn-based artist Heidi Lau creates visionary ceramic sculptures that do not compromise. Her festering castles are remarkable exercises in delicate, chaotic structures, striking a haunting balance between beauty and abject terror. All of Lau's painstakingly crafted works are recreations of histories lost to time and to colonization. They are resurrections of past possible civilizations, entrenched in mysticisms and the primordial. One could almost imagine them as the discarded set miniatures from a Guillermo Del Toro film that was too controversial and dark to put into production. We'd watch that in a heartbeat!